Whenever you have two industry heavyweights collaborating on a comic book project it's easy to get carried away and build the hype to unreachable heights. 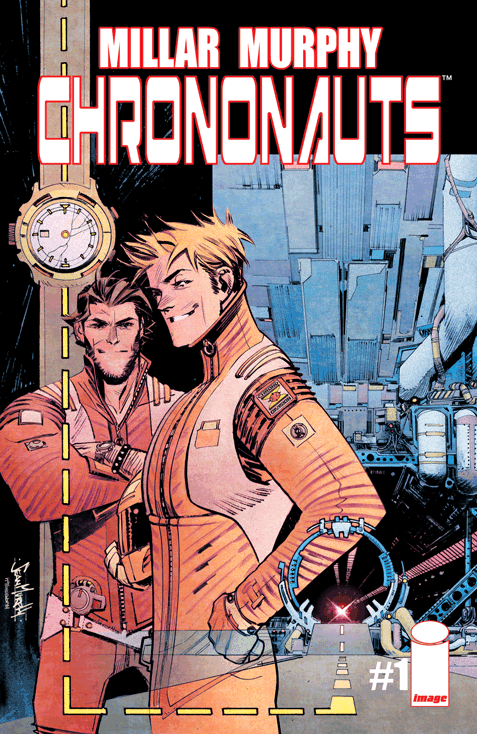 Chrononauts #1 by Mark Millar and Sean Murphy was highly anticipated and with good reason. Both have a body of work that represent the best comics has to offer. After one issue, Millar and Murphy have another highlight to add to their legacies. Corbin Quinn and Danny Reilly are brilliant scientists who just discovered the technology to time-travel. The run-up to their first manned excursion back in time goes fast, the pacing is quick with minimal exposition. The scope is huge, cinematic, and Murphy's art is the best it's ever been. The two leads fit familiar tropes, one's more professional and serious while the other is the wacky goofball who's more of a wildcard. Millar does a nice job of tethering the two to actual sentiment. Quinn's emotional phone call to his ex-wife exposes some sincere soul searching that adds dimension to the chrononaut. When things go haywire Reilly reveals just how much he cares for his friend and fellow time traveler. As brisk and concise as the script is, it's Murphy's pencils and Matt Hollingsworth's colors that steal the show. A Turkey sunset, a field of Civil War soldiers, a crowded press conference (with some easter eggs of time machines of the past) and every panel designed with intricate detail and subdued colors that just envelope the eye. Then they fire up the time portal and rays of electric pink, orange and white scatter the page in a flurry of energy. The transition as the chrononauts enter is a masterclass in conveying kinetic movement through a vacuum of space and time. There's an interesting subplot that finds modern artifacts displaced in time. A fighter jet found in an ancient temple. Something is amiss and Millar leaves you not just scratching your head but wanting more. Especially when our heroes themselves get displaced. Chrononauts #1 lives up to the hype as a great time-traveling adventure under the expertise of comic book titans. I can't recommend this book more. Jump aboard and add Chrononauts to your pull list now!